Stuart Brennan – (Risen – 2010). Hey Stuart. Thanks for taking the time out to talk to me. You have a new film coming out in UK cinemas this week called ‘Risen‘, which you both produced and starred in. It’s based on the true story of how boxer Howard Winstone became Featherweight Champion in 1968 – at the age of 29. What made you want to turn his story into a film? The director Neil Jones is from Merthyr, where the film is set and where Howard Winstone was from and it was a story he had always wanted to turn into a movie. As we researched the project together and the script started taking shape it became a very personal project for the both of us, particularly working with the family and Howard’s friends to make the project a reality. The fact that the family is proud of the movie has been the most important thing to us from day one and we’re very happy that they love the finished article as much as us. You play the main lead – Howard Winstone – how hard was it for you to get into the role? Did you have to have boxing training and do extensive research? Boxing is the hardest sport in the world and I went into this movie without any experience in the ring at all. When I first asked Howard’s sparring partner Don James to train me for the role, he laughed and said it couldn’t be done. After a bit of begging he agreed to give me a chance and 6am the next day we were out on the roads. That was the foundations of the role for me, getting the boxing right. And I couldn’t have asked for a better trainer, or a better source of information on the whole project, than Howard’s best mate, Don. He gave me fights to watch, footage of Howard outside the ring, would tell me stories about Howard and the era and introduce me to a whole range of people who knew him. We even went for meals at Howard’s old haunts. Everything I could research I did and from it grew nothing but a huge respect for this incredible boxer Howard and the amazing, generous people of Merthyr and Wales. How would you say ‘Risen’ is visually different to other boxing films like ‘Rocky’ or ‘The Fighter’? Neil Jones said from day one that we had to make the fight scenes stand out and he was correct. It’s the first thing people look to judge about the movie. So what he did was to give each fight scene a unique feel, the final fight scene is very much ‘Rocky’, the middle fight with Saldivar is ‘Raging Bull’, some of the early ones are like ‘Cinderella Man’ and he even created new styles. Visually, it really captures the era, yet stays interesting throughout. Our other big selling point is that the boxing is real. Those punches are landing! And that’s a first in the world of movie making, to my knowledge. 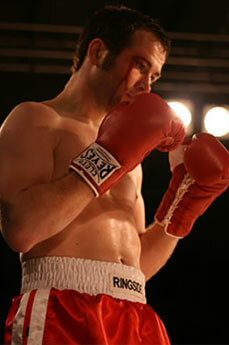 In your mind, what was it that made Howard Winstone a good boxer in terms of skill and movement? His golden rule: Jab and move. Howard would hit fast and accurately and then be gone. His work rate was second to none and he would have that piston-like jab going every moment of the round. It’s an incredibly difficult style to fight against. He was also a very clever fighter, knowing when to turn the heat up and when to get out of the action and box. What was it like on-set? I hear Shane Ritchie plays a part in the film…. Because the project was so personal to us, filming was always great fun. It took us five years to make the movie (due to financial issues) and so we filmed sporadically over that period. That made it more intense; it was such a relief to film that we were super hyped for it. Working with the other actors was incredible, it was a real acting lesson. Shane Richie was particularly good fun, he was full of energy, excited to be working on the movie and very generous with his time. He would take photos with everyone who wanted them and tirelessly sign autographs. He’s a very spontaneous actor and was constantly coming up with ideas and movements, many of which made the final film. John Noble was another actor who had just come off the ‘Lord of the Rings’ films when we first shot with him, so he was full of great stories from that shoot, as well as from the ‘Fringe’ set when we shot with him a few years later for his final scenes. And of course I’ll never forget filming with Erik Morales, who plays Saldivar, my main opponent in the film. A five time world champion, who jokingly said at dinner the night before we filmed “I’m going to knock his (my) head off!” A gentleman and phenomenal athlete, who could go onto act if he wanted to. Boxing him was an incredible experience. It was three days of pain, adrenaline and jubilation, I literally had to keep pinching myself that we were about to finish the film and Erik Morales was in the ring with me! Templeheart films are to thank for that, they provided us with the finance to finish the movie, so a huge thank you to them! Have any of Howard’s family seen the film yet and commented on it? Howard’s family have watched the film more times than I have! They love it and are incredibly proud of it. They had input into the script and the entire process, so it was a very personal journey for them and one that they had never experienced before. Making a film is an intense process, which takes a long time and so they have been with us all the way through and are now our biggest supporters. Let’s talk about you Stuart. What made you want to get into acting in the first place? I’ve always been fascinated by jobs and always thought I’d love to try other people’s jobs – being a pilot, soldier, chef, waiter, lawyer, doctor, goat herder! I find what other people do interesting and so acting was always an opportunity to get a glimpse into those lifestyles. So there was my interest and then when my parents saw me in a play in college that they were very impressed by, they said that they would support me if I wanted to do it as a career – which from them was a huge endorsement – as they didn’t relish my ideas of being a professional footballer (just as tricky a career path!) and were just as happy with me studying law. So with their backing and plenty of enthusiasm I went off and studied Drama at Winchester and I’ve never looked back. What advice would you give to anyone wanting to pursue a career in acting? You have to live and breathe acting. Money can not be your focus at all, as you’re not going to get paid for a long time. And then you need a thick skin – reviewers, auditions and the public do not hold back if they don’t like something. I think the most important piece of advice though, is don’t give up and make your own luck. With YouTube and social networking sites these days anyone can make a film, or network with film-makers, so get out there and find like-minded people and do something creative together. We’ve already mentioned you’re a producer – if a writer came to you with an idea, what would you be looking for? A story with a strong heart. My main comment on independent films is that they often lack heart, there’s little emotional connection with the audience. And that starts with the script. The best independent films make you fall in love with the characters and care what happens to them. It sounds simple, but so many people get it wrong. In the early stages of your career you were mostly producing and creating shorts – how important do you think the indie industry is? What does a Stuart Brennan day usually consist of? I have two projects I’m working on at the moment. We’re currently filming ‘The Reverend’ with Rutger Hauer (legend! I’m hugely excited!) and Tamer Hassan (a brilliant actor in his own right). Neil Jones is directing from his own script and I’m producing with him as well as taking the lead role. It’s a vampire film that’s got a great story and some fascinating set pieces. Lots of blood and gore! My other project is one I’m developing called ‘The Black Knight’, which I’m hoping we might film towards the end of the year. Watch this space! Previous James Floyd – (Everywhere And Nowhere – 2011). Next Marc Senter – (Red, White & Blue – 2010).